At the pinnacle of the Gilded Age, a boycott of Pullman sleeping cars by hundreds of thousands of railroad employees brought commerce to a standstill across much of the country. Famine threatened, riots broke out along the rail lines. Soon the U.S. Army was on the march and gunfire rang from the streets of major cities. Two iconic characters of the age: George Pullman, who amassed a fortune by making train travel a pleasure, thought the model town that he built for his workers would erase urban squalor. And Eugene Debs, founder of the nation’s first industrial union, was determined to wrench power away from the reigning plutocrats. 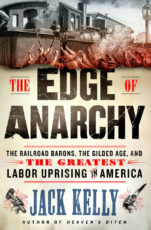 The clash between the two men’s conflicting ideals pushed the country to what the U.S. Attorney General called “the ragged edge of anarchy.” President Grover Cleveland in 1894 worried about a national insurrection as the country grapple with a deep depression.